The Ritchie Hollow Trail is moderately strenuous and 2.7 miles one way (5.4 miles round trip), with over 1,200 feet of elevation gain. The trail passes a beautiful 30-foot waterfall called Blowing Wind Falls. The unique trail meanders through a mature hardwood forest and passes many historic moonshine stills. 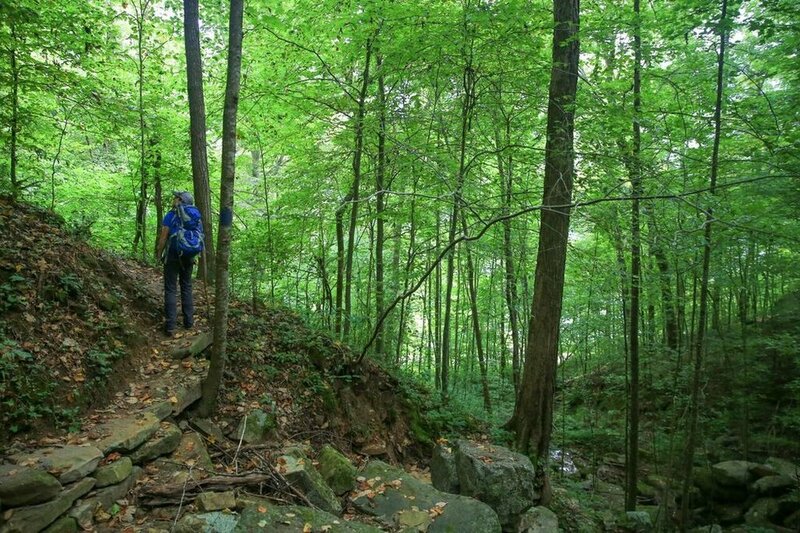 It is one of only a few trails that connect the Tennessee River with the Cumberland Trail system at the top of the mountain (more specifically, the Pot Point Loop Trail). Park at the gravel parking lot across from the Pot Point Cabin at 17805 River Canyon Rd, Chattanooga, TN, 37405 and access the trailhead just above the parking lot. The Trust wants to give the Chattanooga community more access to the beautiful lands in the River Gorge. By connecting more people to the outdoors, we can then build the capacity for community conservation. To understand the importance of conserving our wild lands you must first get to know them. The Ritchie Hollow Trail was built with local partnerships. We built the trail, but it is on Prentice Cooper State Forest. We are able to build trails on their land because of a Memorandum of Understanding we have with them. We received grant funding from Rock/Creek, the Riverview Foundation, and the Benwood Foundation to hire the Southeast Conservation Corps to build the most technical sections of the trail. We built the rest of the trail with volunteers from the community including Rock/Creek, the Chattanooga Hiking Club, and TVA.